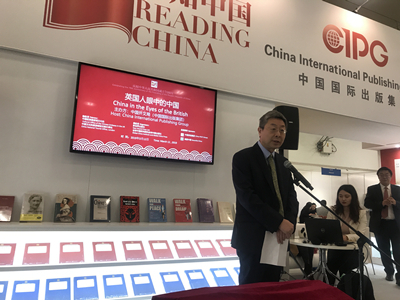 On March 12, 2019, Minister Ma Hui attended and addressed the book exhibition and launch ceremony of “Celebrating the 70th anniversary of the founding of the People’s Republic of China and the 65th anniversary of the establishment of China-UK diplomatic relations at the level of chargé d'affaires -- China in the Eyes of the British” by the China International Publishing Group (CIPG) at London Book Fair. Over 80 people were present, including Liu Dawei, Vice-President of CIPG, the Rt Hon. Lord Bates PC, the Rt Hon. Lord Wilson KT GCMG FRSE, Martin Albrow, Fellow of the Academy of Social Sciences, Frances Wood, former Curator of the British Library's Chinese Collections, Charles Aylmer, Head of Chinese Department at Cambridge University Library and Hugo de Burgh BA (Hons) MA PhD FRSA, Director of the China Media Centre at the University of Westminster as well as representatives from culture, education, publishing and media sectors in China and the UK. Minister Ma noted that recently, CIPG has published many books, including Xi Jinping: the Governance of China, Understanding China Series, Why and How CPC Works in China series, Chinese Dream: What It Means for China and the Rest of the World, The Belt & Road Initiative, What China Can Offer in Its Rise, which covered the progress of New China in the past 70 years and help explain socialism with Chinese characteristics. 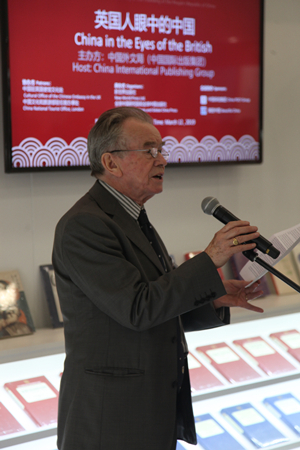 The newly launched books agreed with the theme of the China-UK friendship. China’s Role in a Shared Human Future by Professor Albrow, which offers a new perspective on China’s rise, is based on deep understanding of Chinese ideas, Chinese road and Chinese solutions. PINGJU: Real Life Opera and a ‘Rural Chinese Shakespeare’ authored by the late John Chinnery, a noted British sinologist, is a comprehensive work on Chinese culture and folk customs. Walk Your Dream and Walk for Peace by Lord Bates tells vivid stories of peace, New China, the Chinese People, and China’s reform and opening-up from a unique perspective. These books help enhance foreign readers’ understanding of China in a comprehensive and objective way. Minister Ma expressed the hope that China and the UK would deepen exchanges in publishing, culture and academic research, so as to make greater contribution to an enduring and steady China-UK “Golden Era”. Vice-President Liu said that CIPG has brought over 600 China-themed books to the Book Fair, including Xi Jinping: the Governance of China, Why and How the CPC Works in China series, Understanding China Series, The Keywords to Understand China Series, etc. These books tell China’s stories and make China’s voice heard, helping readers from all over the world learn and understand a real, multi-dimensional, lively and comprehensive China. 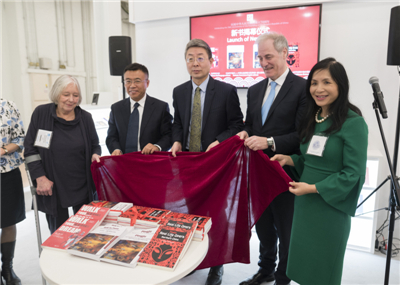 The “Chinese in the Eyes of the British” book exhibition would showcase more than one hundred titles published by CIPG over the past 70 years on the subject of relations between China and the UK. 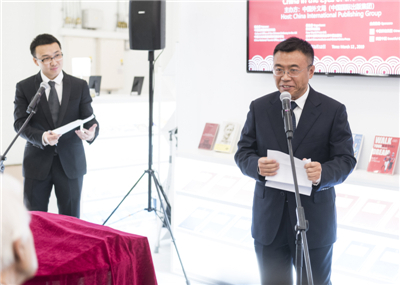 The newly launched books, Walk Your Dream and Walk for Peace, PINGJU: Real Life Opera and a‘Rural Chinese Shakespeare’ English Edition, and China’s Role in a Shared Human Future represent the latest achievements of the cultural and academic exchanges between China and the UK. CIPG will further promote exchanges between the two countries in the fields of culture, publishing and media so as to enhance mutual understanding and cooperation between China and the UK. Lord Bates said that over the past 40 years of reform and opening up, an economic miracle has taken place in China. He was deeply impressed by China’s progress through walking in China and appreciating the real life of ordinary Chinese people. Professor Albrow said that countries in the world, China and the US in particular, need to strengthen cooperation to address global challenges. Different from the Western governance model, the Belt and Road Initiative and the idea of building a community of shared future for mankind transcend the differences in national values. They are Chinese experiences and resolution about global governance, stressing mutual learning, complementary strengths, pragmatic cooperation, and result sharing. Wood talked about the background of Chinnery’s work PINGJU: Real Life Opera and a‘Rural Chinese Shakespeare’ and his profound friendship with Chinese Pingju artists. Ma also visited the exhibition booths of Phoenix Publishing & Media and China Publishing Group.